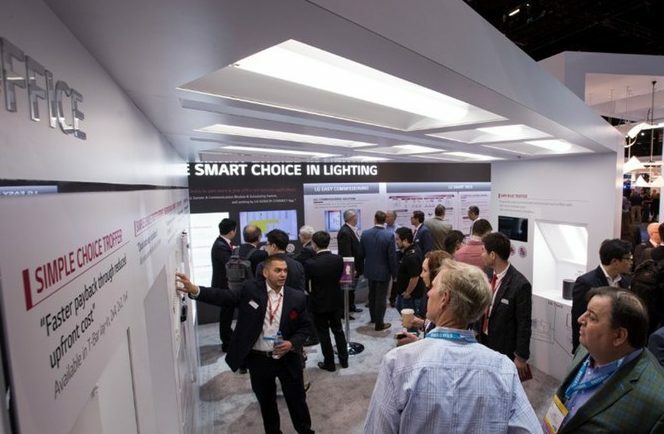 by Brianna Crandall — May 16, 2018 — LED lighting technology provider LG Electronics has unveiled next-generation smart lighting advancements with greater flexibility and connectivity options. The super-efficient new LG Simple Choice light-emitting diode (LED) high-bay lights and LG Sensor Connect application were introduced at LIGHTFAIR International 2018. Said to be known for driving profitability and payback in retrofit projects, LG LED solutions now include even more retrofit lighting options — lightweight, easily installed, cost-efficient upgrades with wireless control through an intuitive mobile app, according to Jim Bailey, head of LG’s US LED lighting business. Our next-generation LED high bays and Sensor Connect app are optimal choices for commercial building managers seeking upgrades to their existing lighting. LG’s industry-leading LED solutions consistently increase our customers’ return on investment with our highest-efficiency troffers. Our newest cost-effective and energy-efficient offerings, with streamlined commissioning and connectivity, allow for them to be easily integrated with existing building management systems. This shows how LG is once again bringing state-of-the-art LED lighting and seamless integration innovations to the market. LG’s second-generation high-bay lights combine greater efficiency with higher-efficacy 150LPW for maximum energy savings and ease of installation with multi-sensors providing motion and daylight harvesting sensing and integrated ZigBee wireless technology. These sensors are equipped with enhanced commissioning technology that can identify the addressable device through light patterns. Once commissioned, there is a wide selection of control options such as light levels, time-out features, fade rates and scheduling. The lightweight design allows for easy installation along with design enhancements to allow for natural cooling of spaces. LG’s latest Simple Choice high-bay lighting solution is an ideal solution for large indoor spaces such as warehouses, factories and gymnasiums, Bailey said. The next-generation LG Sensor Connect mobile application allows users greater control of lighting. The Android app comes embedded with VLC technology, a cutting-edge communication platform that can transmit data between fixtures and control devices using the visible light emitted by LED lights, simplifying and accelerating the commissioning process. The ZigBee-to-Analog Transformer can enable any luminaire with a 0-to-10-volt dimmable driver to be controlled using the LG Sensor Connect app. The ZAT is simply wired to the line voltage and the dimming leads of the fixture, and a dongle is inserted into the slot, which enables each fixture to be addressable and controlled wirelessly. The low-cost Simple Choice LED troffer line retrofit option for existing facilities looking to upgrade their lighting capabilities is compatible with LG Sensor Connect. This troffer can be programmed with customizable light levels, allowing for greater energy savings and flexibility in fixture management. LG’s round, IP65-rated high bay, a performance model within the company’s broader high-bay line-up, is well-suited for installations in food-processing facilities and gymnasiums. The fixture is lightweight, weighing less than 10 pounds, allowing for easier installation. LG’s battery and AC wired scheduling switches, which fit into a standard switchbox, allow retrofit installers to easily upgrade existing switches. These switches offer full wireless control using ZigBee to easily configure and control fixtures, along with an energy-saving set scheduling feature. For more information about the Simple Choice retrofit lighting, Sensor Connect app, and the company’s complete US lighting portfolio, visit the LG Lighting website. Are your LEDs wearing out faster from using energy-saving lighting controls? This LED is made to withstand twice as many switching and dimming cycles August 31, 2018 In "Products and Services » Lighting"
ERP teams up with Lumenetix to offer accuracy, consistency, color control and flicker-free dimming to its lighting systems October 19, 2018 In "Products and Services » Lighting"
Figure out how effective a lighting control method will be, from this new NEMA framework July 6, 2018 In "Products and Services » Publications"
Want to replace 4-foot fluorescent lights? These EarthTronics LED Wrap Fixtures feature advanced controls — with a 50,000-hour performance life March 6, 2019 In "Products and Services » Lighting"
Need to replace your exterior lighting? Check out these hardy LED wall packs from EarthTronics August 17, 2018 In "Products and Services » Lighting"